The Internet also referred to as the net, in simplest terms, consists of large a group of millions of computers around the world that are connected to one another. It is a network of networks that consists of millions of private, public, academic, business, and government networks, local to global scope, that are linked by a broad array of electronic, wireless and optical networking technologies such as phone lines, fibre optic lines, coaxial cable, satellites, and wireless connections. The Internet seems to be everywhere today with many people and devices connected to it. When connected to the Internet people can access services such as online shopping, listen to radio and TV broadcast, chat, and send mail, access information, read newspaper and so on. Today Internet is not only accessed from regular stationary computer but also from mobile / portable devices such as Personal Digital Assistants (PDAs), cell phones, netbook, iPod, iPad, Palm Pilots and others. The Internet originated as a proposal from the Advanced Research Project Agency (ARPA). The idea was to see how computers connected in a network i.e. (ARPANET) could be used to access information from research facilities and universities. In 1969, four computers (located at UCLA, Stanford Research Institute, University of California Santa Barbara and the University of Utah) were successfully connected. As time went on, other networks were connected. With four nodes by the end of 1969, the ARPANET spanned the continental United States (US) by 1971 and had connections to Europe by 1973. Though the Interconnected Network, or Internet, was originally limited to the military, government, research, and educational purposes it waseventually opened to the public. Today there are hundreds of millions of computers and other devices connected to the Internet worldwide. Other definitions that are closely related to the term Internet are intranet and extranet. The term “Intranet” is used to describe a network of personal computers(PC) without any personal computers on the network connected to the world outside of the Intranet. The Intranet resides behind a firewall; if it allows access from the Internet, it becomes an Extranet. The firewall helps to control access between the intranet and Internet so that only authorised users will have access to the Intranet. Usually these people are members of the same company or organisation. Like the Internet itself, intranets are used to share information. Secure intranets are now the fastest-growing segment of the Internet because they are much less expensive to build and manage than private network based on proprietary protocols. Extranets are becoming a very popular means for business partners to exchange information. An Extranet is a term used to refer to an intranet that is partially accessible to authorised outsiders. Privacy and security are important issues in extranet use. A firewall is usually provided to help control access between the Intranet and Internet. In this case, the actual server will reside behind a firewall. The level of access can be set to different levels for individuals or groups of outside users. Dial-up Internet access is a form of Internet access that uses the facilities of the public switched telephone network (PSTN) to establish a dialed connection to an Internet service provider (ISP) via telephone lines. The user’s computer or router uses an attached modem to encode and decode Internet Protocol packets and control information into and from analog audio frequency signals, respectively. The term “Dial-up Internet access” was coined during the early days of computer telecommunications when modems were needed to connect terminals or computers running terminal emulator software to mainframes, minicomputers, online services and bulletin board systems via a telephone line. To use a dial-up account, you need a modem. A modem (modulator-demodulator) is a device that modulates an analogcarrier signal to encode digital information, and demodulates such a carrier signal to decode the transmitted information. To distinguish dial up modems from newer, high-speed modems, they are could also be called analog modems or dial-up modems. Most computers come with an internal modem and most ISPs support modems at speeds of 28.8 kilobits per second (Kbps) and 56 Kbps. With dial-up, you connect only when you want to use Internet services and disconnect (hang up) when you are done. This type of data transmission is similar to using thetelephone to make a call. The client computer modem dials the preprogrammed phone number for a user’s Internet Service Provider (ISP) and connects to one of the ISP’s modems. Once the ISP has verified the user's account, a connection is established and data can be transmitted. The communication ends when either modem hangs up. Dial-up connections is not expensive (it costs no more than a local telephone call) but the speed is usually low at about 28kps – 46kps because of the limitations of analog phone lines and telephone company switches. Integrated Services Digital Network (ISDN) is a set of communications standards for simultaneous digital transmission of voice, video, data, and other network services over the traditional circuits of the publicswitched telephone network. It allows dial up into the Internet at speeds ranging from 64 to 128 kbps. For this connection to be available, telephone companies would have to install special ISDN digital switching equipment. The ISDN service intended for residential use is Basic Rate Interface (BRI). On one ISDN line, BRI provides two 64-Kbps channels, or B (bearer) channels, and one 16-Kbps channel, or D(data) channel. The D channel is mostly used for signalling such as to indicate that the line is busy. The B channels are where the action is. Two B channels can be combined to have a 128-Kbps line to theInternet. This is roughly twice the speed of the fastest analogue modem,56 Kbps. To connect to your ISP via ISDN you need to confirm the availability of the access and this will require you to have an ISDN adapter. ISDN lines are more expensive than normal phone lines, so the telephone rates are usually higher. This is a connection made to the Internet via a Cable TV modem. The modem is designed to operate over cable TV lines. Since the coaxial cable used by cable TV provides much greater bandwidth than telephone lines, a cable modem can be used to achieve extremely fast speed as high as 128 kbps to 10 mbps to the World Wide Web. This combined with the fact that millions of homes are already wired for cable TV in developed countries has made the cable modem something of a holy grail for Internet and cable TV companies. The services offered are usually at low cost for unlimited, “always connected” access. However, there are a number of technical difficulties in this type of connection. The problem is that the cable network was designed to move information in one direction, from the broadcaster to the user. Downstream speeds have been very impressive such that the line can theoretically bring you data as fast as 30 Mbps but upstream speed depends on line quality. The Internet, however, is a two-way system where data also need to flow from the client to the server. In addition, it is still unknown whether the cable TV networks can handle the traffic that would ensue if millions of users began using the system for Internet access. Large cable companies are spending money to upgrade their networks to Hybrid Fiber-Coaxial (HFC) to handle two way traffic better. Smaller providers cannot afford the upgrade, so they have to use a phone line at 28.8 Kbps for upstream data. Another issue bothers on security and the need to either share or not share files amongst users. Digital Subscriber Line (DSL) is a family of technologies that provides digital data transmission over the wires of a local telephone network. DSL service is delivered simultaneously with regular telephone on the same telephone line. DSL uses a different part of the frequency spectrum from analogue voice signals, so it can work in conjunction with a standard analogue telephone service, providing separate voice and data “channels” on the same line. Internet: more downloads than uploads. The line is asymmetric, because it has more capacity for data received by your computer (such as graphics, video, audio, and software upgrades) than for data that you send (such as e-mail and browser commands). The data through put of consumer DSL services typically range from 256 kbit/s to 40 Mbit/s in the direction to the customer (downstream), depending on DSL technology, line conditions, and service-level implementation. In ADSL, the data throughput in the upstream direction, (i.e. in the direction to the service provider) is lower, hence the designation of asymmetric service. In Symmetric Digital Subscriber Line (SDSL) service, the downstream and upstream data rates are equal. Unlike cable modem technology, DSL provides a point-to-point connection to ISP. Somehow, this technology seems to be both more secure and less prone to local traffic fluctuations than its cable rival. 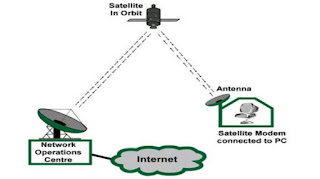 Digital Satellite Systems (DSS), or direct broadcast satellite, allows one to get Internet information via satellite. Satellite Internet systems are an excellent, although rather costly, option for people in rural areas where Digital Subscriber Line (DSL) and cable modem connections are not available. A satellite installation can be used even where the most basic utilities may be lacking, if there is a generator or battery power supply that can produce enough electricity to run a desktop computer system. The two-way satellite Internet option offers an always-on connection that bypasses the dial-up process. In a two-way satellite Internet connection, the upstream data is usually sent at a slower speed than the downstream data arrives. Thus, the connection is asymmetric. A dish antenna, measuring about two feet high by three feet wide by three feet deep, transmits and receives signals. Uplink speeds are nominally 50 to 150 Kbps for a subscriber using a single computer. The downlink occurs at speeds ranging from about 150 Kbps to more than 1200 Kbps, depending on factors such as Internet traffic, the capacity of the server.The main advantage of the Satellite technology over cable modems and DSL is accessibility. Satellite connections are faster than dial up and ISDN. Although it is not as fast as cable modems or DSL services, which both can provide more than megabits of bandwidth. In addition, cable and DSL access methods are cheaper.Equipment required for satellite connection includes installation of a mini-dish satellite receiver and a satellite modem. Satellite systems are also prone to rain fade (degradation during heavy precipitation) and occasional brief periods of solar interference. The bandwidth and transfer rate determine how quickly pictures, sounds, animation and video clips will be downloaded. Since multimedia and interactivity make the Internet such an exciting tool for information sharing, the speed is the key. Dial-up access provides an easy and inexpensive way for users to connect to the Internet, however, it is a slow-speed technology and most users are no longer satisfied with dial up or ISDN connections. Fortunately, the broadband access, we once dreamed of, is now possible with TV cable, DSL and satellite links. Behrouz, A. F. (2003). Data Communications and Networking. (3rd ed.). N.Y, USA: McGraw-Hill/Osborne. Brian, et al.(1999). Using Information Technology: A Practical Introduction to Computers and Communication. Irwin/McGraw Hill. Terry, F-M. (2009). Web Development and Design Foundations with XHTML. USA: Pearson . L. & Mathew, L. (1999). Fundamentals of Information Technology. New Delhi: Vikas Publishing House PVT LTD.
Andy, S. (1999).Computer Communications, Principles and Business Applications. (2nd ed.). England: McGraw-Hill.